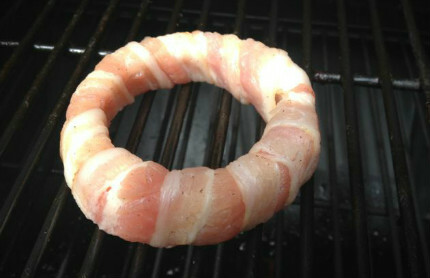 A few weeks ago, a photo of onion rings wrapped and grilled in strips of bacon went viral. A gentle reminder that just about everything tastes better with bacon—a philosophy espoused by most of the members of this barbecue community. Especially when you use a home-cured, hardwood-smoked bacon, which I taught you how to make in a blog post earlier this month. The onion rings set me thinking about other foods that taste seriously awesome grilled wrapped in bacon. The usual suspects, like shrimp, scallops, and chicken livers. The not so usual suspects, like bocconcini (mini mozzarella balls), peaches and prunes. In our continuing celebration of National Bacon Month, here are eight of my favorite foods to grill wrapped in bacon. Use the following ideas as a springboard for your own imagination. Sweetbreads? Asparagus? Pears? The possibilities are endless. In the best of all worlds you’d use homemade bacon, or a good artisanal brand like Nueske’s of Wisconsin. (You may be surprised to learn that most supermarket bacon is injection-flavored with brine and liquid smoke.) Nueske’s has been smoking bacon over apple wood since 1933. Available nationally, it’s my default bacon when I can’t find an interesting local brand at the farmers’ market. Incidentally, Zingerman’s, the great food emporium of Ann Arbor, Michigan, has a Bacon of the Month Club. So after you’ve tried my eight faves, come up with a few bacon-wrapped masterpieces of your own. Snap a photo and show us the mouthwatering details on the Barbecue Board. Village Hammers (Bacon-Grilled Prunes): Stuff pitted prunes with batons of Gouda cheese, then wrap each with short pieces of bacon (cut strips crosswise into halves or thirds), securing with a knotted skewer or small bamboo skewer. (Have most of the skewer on one side, so it looks like a hammer handle.) Direct grill over medium-high heat until the bacon is crisp and the cheese is melted, 2 to 3 minutes per side, turning frequently with tongs. Slide a grill shield or rectangle of folded foil under the exposed part of the skewer to keep it from burning. Bacon-Grilled Peaches: Pit ripe freestone peaches and cut into quarters. Make a lengthwise slit in each piece and stuff with thin slices of Taleggio or Fontina cheese. Wrap each peach quarter in a strip of bacon (cut crosswise into halves or thirds), securing with toothpicks. Direct grill over medium-high heat until the bacon is crisp and the cheese is melted, 2 to 3 minutes per side, turning with tongs. Bacon-Grilled Dates: Stuff large pitted dates with cubes of smoked mozzarella or other cheese. Wrap each in a strip of bacon (cut crosswise into halves or thirds) Secure with toothpicks. Direct grill over medium-high heat, turning frequently with tongs, until the bacon is brown and crisp, 2 to 3 minutes per side. Bacon-Grilled Watermelon: Cut a fresh watermelon into 1-inch chunks. Place a thin slice of halloumi or other salty cheese on top of each and wrap with a strip of bacon (cut crosswise into halves or thirds). Secure with toothpicks. Direct grill over medium-high heat, turning frequently with tongs, until the bacon is brown and crisp, 2 to 3 minutes per side. Bacon-Jalapeño-Grilled Shrimp: Top raw, peeled, deveined jumbo shrimp with thin slices of fresh jalapeño chiles and sprigs of cilantro. Wrap each with bacon (cut crosswise into halves or thirds), and secure with a toothpick. Grill over medium-high heat until the bacon is brown and crisp and the shrimp is cooked through, 3 to 5 minutes in all, turning once with tongs. Bacon-Grilled Bocconcini: Wrap well-chilled bocconcini (bite-size mozzarella balls) with large basil leaves, then with bacon or pancetta strips (cut crosswise into halves or thirds). Secure with toothpicks. Grill over medium-high heat, turning as needed, until the bacon is brown and crisp and the cheese is just beginning to melt, 3 to 5 minutes in all. Bacon-Grilled Chicken Drumsticks: Season 6 skinless chicken drumsticks with your favorite barbecue rub. Tightly wrap each drumstick from top to bottom in strips of thin bacon. Indirect grill over medium heat (about 350 degrees) until the bacon is brown and crisp and the chicken is cooked through to an internal temperature of 165 degrees, 45 to 50 minutes. 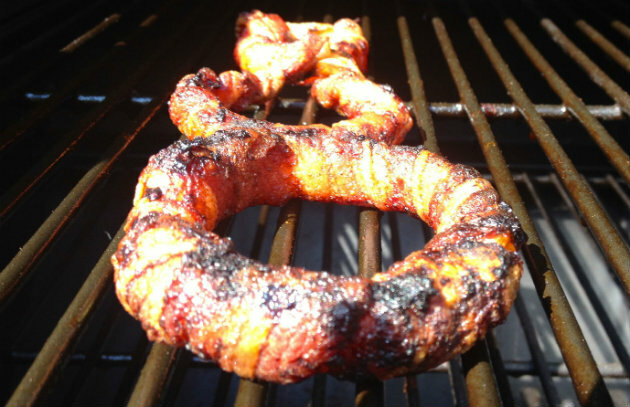 Bacon-Grilled Onion Rings: Peel 4 large sweet onions and slice crosswise into 1/2-inch slices. Separate into large rings, each with 2 layers of onion for sturdiness. (Save the smaller pieces for another use.) You should have about 12 good rings. Spiral 1 to 1 1/2 slices of thin bacon tautly around each ring, overlapping the bacon slightly to completely cover the onion. Secure with toothpicks. Indirect grill over medium heat (about 350 degrees) until the bacon is brown and crisp, 20 to 25 minutes.